Prepsters, get ready! 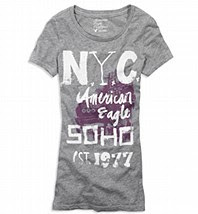 Nov 9th American Eagle Outfitters will open its doors to the public and debut a three-level, 24,000-square-foot flagship store in Soho, New York. The first five-hundred shoppers will receive FREE $50 gift certificates, and an official "Mud Truck" will be on-sight to provide refreshments. I'm bringing a friend that doesn't like American Eagle. Double score! !